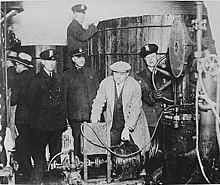 ^ History of Alcohol Prohibition. National Commission on Marihuana and Drug Abuse （英語）. ^ Jack S. Blocker，David M. Fahey，Ian R. Tyrrell. Alcohol and Temperance in Modern History: An International Encyclopedia （英語）. ^ Jack S. Blocker, Jr. Did Prohibition Really Work? Alcohol Prohibition as a Public Health Innovation. American Journal of Public Health （英語）. ^ Wayne Hall, "What are the policy lessons of National Alcohol Prohibition in the United States, 1920–1933?." Addiction (2010) 105#7 pp: 1164-1173.